The best thing I did in Buenos Aires? 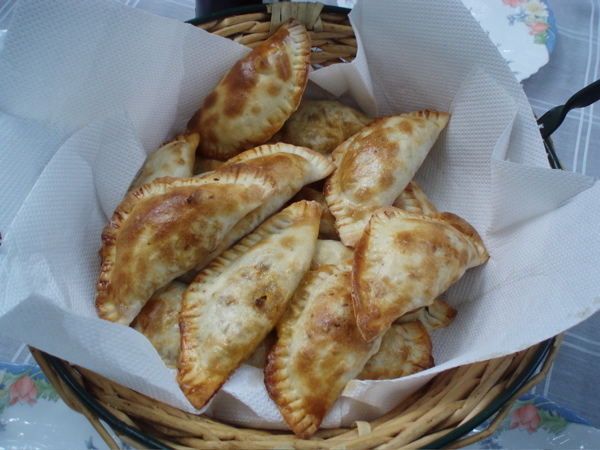 Take an amazing empanada cooking class with the lovely Teresita! It was so fun to see a real Porteno’s house, cook in her kitchen, and learn all her empanada secrets. We made 2 different types – one with beef, olives, egg, and raisins and one with sweet corn called “humita” (my favorite). Both types are classic Northern Argentina dishes. We even made the dough from scratch (see my lovely friend Kate’s kneading skills below). Once all our fillings were cooked and chilling in the fridge, Teresita taught us how to roll out the dough, fill the tiny empanada pockets, and close them with 2 different techniques that make 2 really beautiful designs. Then we baked a few of each and fried a few of each in sunflower oil. For the fried ones, Teresita sprinkled a bit of sugar on top and it was like eating a little piece of heaven. She also served some delicious white wine called Torrontes—which was the only white wine I drank in this red wine-centric country. I took copious notes, but I really wish my kitchen was a bit bigger and my oven a LOT bigger so I could make these for all my friends. Still, I’m going to try! It’s going to be hard since everything we learned was in the metric system, oy!